The Hollywood Reporter says Disney X D will air a new 5-part animated series that retells the saga LEGO style. No word on when this will air. 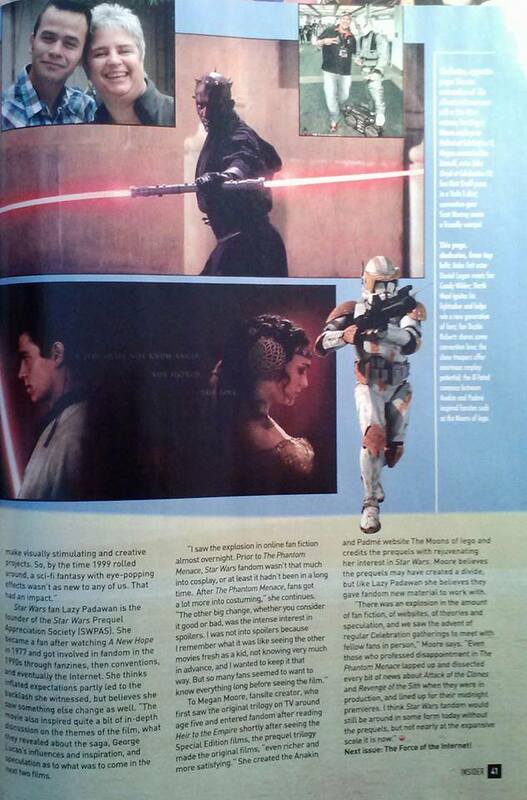 Everybody Buy Star Wars Insider #156! Star Wars Insider #156 is just appearing now in subscribers’ mailboxes and should be on the stands soon if not already. I’ll have to go out and buy one because my subscription lapsed. Why should I or any of you buy it? Because there’s an article in it about the prequels and fandom, and it includes some of your favorite SWPAS regulars and yours truly (though I don’t reveal my real name). That’s why I had everyone send me e-mails a couple of months ago…to help field people to the person writing the story. So thanks to everyone who participated! In case you missed it, there’s a piece on starwars.com about the role of mentors in the saga; I thought it was interesting and refreshing that he mentions Padmé’s role as a mentor to Anakin. Also on starwars.com is a neat post about the shadow figure in mythology and how it figures in Star Wars. While looking up “droideka” for something else, I came upon a dubstep act named Droideka. I don’t know much about them (him, her if it’s just one person) but it’s got a good beat, you can dance to it, and I love that it references the prequels’ awesome rolling droids of doom. The Cantina Cast has posted a couple more interesting pieces, one about Padmé and the other about the wisdom of “holding back” that drove Anakin crazy. Becca Benjamin has two new essays. One on The Cantina Cast focuses on parallels in Anakin and Luke’s story arcs, while another on Coffee With Kenobi examines similarities between Leia and Padme. Clone Wars Arc To Be Released Soon? The Celebration Anaheim site announced a cavalcade of guests today, both as special guests and as autograph hall guests. The PT-related ones include: Dave Filoni, Ray Park, Amy Allen, Daniel Logan, prequel defender Kyle Newman (about to be a dad a second time with wife Jaime King), and Orli Shoshan. Plus you’ve got host James Arnold Taylor, and saga veterans Anthony Daniels, Kenny Baker, and Peter Mayhew. If you really want to push it, you can also include Jeremy Bulloch, who had a cameo in ROTS, and Mark Hamill, who did a turn as Darth Bane in Clone Wars Season Six. So Why Did I Do This Site Anyway? Seven years plus ago, SWPAS was born of frustration, like that early ’90s song. As I noted in my first post, I felt like somebody had to do something about the way the prequels were being perceived and treated. There were no sites quite like this one (though there have been PT-related fan sites for years) and very few fans who were outspoken about the PT. The good news is that SWPAS is not the only game in town anymore and there are more people now who aren’t as shy about their support for the films. But has it gotten easier for any of us? Yes and no. People on various geek/nerd/comics/whatever sites who try to write anything even remotely positive about the films can still expect a gaggle of trolls and haters to fill up the comments with their bile. I’ve long said the obsessiveness of the haters outweighs the passion with which fans like us will defend the movies. A few people have commented negatively on that obsession but the internet, geek culture, and the media have fed off of it for too long. It’s everywhere. I will admit that there have been many times when I’ve thought of quitting. Is SWPAS really making much of a difference or is it just flatulence in the wind? Taking on the hate machine can seem insurmountable and impossible. Fans can be very difficult to deal with sometimes and I don’t think very many people really understand where I am coming from. This is not a full-time job, it’s just something I do when I have the inspiration and the time. Even if this site was all about puppies, cupcakes, butterflies, and sunshine, there’s always the concern about keeping it fresh and not just phoning it in. I want everyone to recognize that I don’t post inflammatory stuff just to stir the pot or as clickbait. I could sling red meat on here every day to keep up the numbers because controversy draws eyeballs. But I don’t do that, mostly because the focus here shouldn’t be on the latest jackhole to talk smack about the films, Lucas, or whatever. Now if that jackhole manages to get hired to write a Star Wars screenplay, that’s a different story. There’s a responsibility official fandom has to these films and to fans like us and when I don’t think they are living up to that responsibility, I’m going to say so. It sounds like a cheesy cliché to say my readers drive me on, but there is truth to it. There’s a need for saga fans to feel accepted and validated and this is one of the few places where that can happen. The other thing is these movies and those who supported them were done a raw deal and that drives me crazy. Whether my Star Wars fandom fades over time or not, there’s a part of me that will never rest until that’s rectified. It sounds nuts but I’m being honest. Why else would anyone spend time on a site that doesn’t generate money or fame? I ain’t the Man Repeller or the Blonde Salad with magazine covers, big book deals, merchandising tie-ins, and freebies. I’m not even a big name fan. It may be a quixotic quest but that’s my purpose in doing this site. Maybe one day I’ll walk from it for good. Maybe one day, I’ll realize my work here is done. But not today. The full-color, hardcover 72-page book will act as an exhibit guide, containing photos and stories of scores of the items on display. Written and photographed by Steve Sansweet and Anne Neumann, with design and layout by Stan Stice, the book is intended to be the first volume in a series, “The Treasures of Rancho Obi-Wan.” It also includes a 4-page centerspread foldout that has hundreds of photos of visitors to Rancho and to our exhibits at past Celebration events. The new book, with an initial printing of just 1,000 copies, is one of several surprises that Rancho will reveal in the weeks leading up to what many believe will be the largest and most exciting Star Wars fan event ever. The Rancho Obi-Wan Experience exhibit will feature fan objects and art starting in the late 1970s through today, from an airbrushed van tire cover and hand-tooled leather backgammon board to a Chewbacca tissue box cover and bird house, from amazing art mash-ups based on a print by Goya and a painting by Picasso to bizarre limited edition figurines made by urban artists. The book will cost $25 and pre-orders for pick-up at Celebration will begin in March on RanchoObiWan.org. Both Steve Sansweet, chairman and CEO of Rancho Obi-Wan, and Anne Neumann, vice president and general manager, will be available at posted hours to sign the new book at no charge.